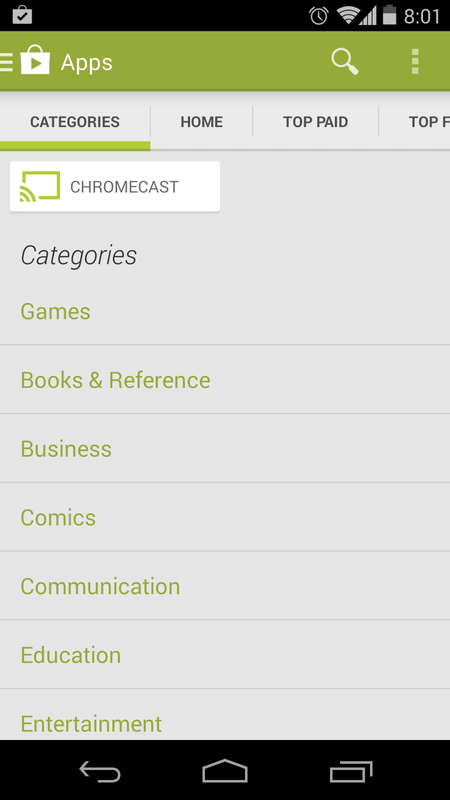 A wild Chromecast tab appears! This may not be hot off the presses, but this is most certainly a newly added addition to the Google Play Store. 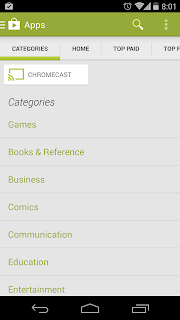 Searching through apps, and sliding over to "Categories" reveals this Chromecast tab seen in the above picture. This amazing little unit was release a few months ago by Google and has slowly be invading peoples TVs. With the addition to the newly added Chromecast tab, are we to expect the list of available apps to start populating with new apps soon? One can only hope as Chromecast is becoming easier and easier for us Canadians to get our frost bitten fingers around. Chromecast isn't available in retails locations right now, but a few online retailers are starting to include Canada when selling this product. 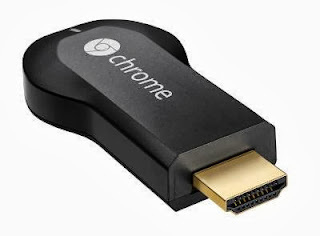 If you haven't yet got yourself a Chromecast, you don't know what you're missing.